As some of you might have noticed, I've been blogging a lot in the past couple of days. The reason? Because I'm doing #BlogYourSocksOffSeptember, something I originally read about on on the lovely Jess' blog Lovely Jubbly. One of my goals for September was to get serious about my blogging, including blogging more regularly, and whilst my original aim was every other day this is certainly embracing that challenge! For those of you who haven't heard of it, #BlogYourSocksOffSeptember is a little bit like the blogging equivalent of NaNoWriMo. The idea is that you blog every day of the month, about whatever you want, with the idea being that it helps bring back your blogging mojo, attract new readers and help you interact more with other bloggers. All you have to do is blog at least once a day in September. You can add the button above to your blog and/or use the hashtag #BlogYourSocksOffSeptember in any tweets you want other bloggers taking part to see. I am immensely excited about doing this challenge, I'm really hoping it's going to get me more into writing and help me build good relationships within the blogging community. Admittedly it's a bit nerve-wracking to have to come up with 30 blog posts, but I have a few things coming up that I can blog about (thank goodness for the new series of Strictly starting) so I'm hoping that I'll be able to keep it up! 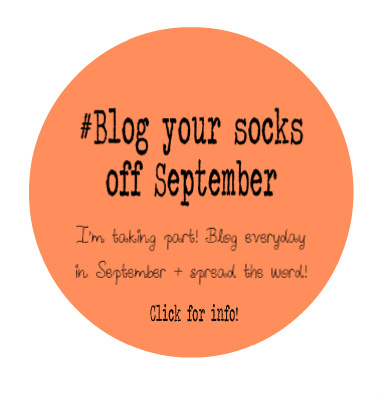 Are you doing #BlogYourSocksOffSeptember? Have you done any other blogging challenges before? And what motivates you to keep writing your blog? Let me know in the comments and have a great day!